The look of custom, the ease of Prefab! 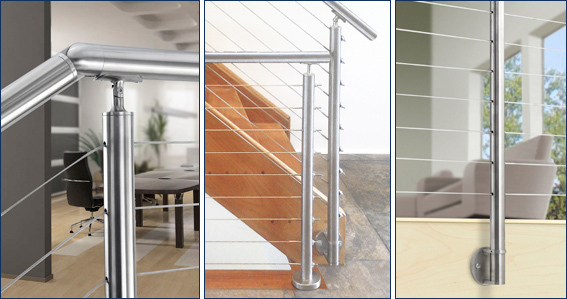 Eastern Metal Supply is now offering a complete prefabricated stainless steel railing system! This new premium line of modular stainless steel railings and components offers European design and modern elegance that is suitable for both indoor and outdoor use. The pure beauty of this stainless steel railing systems is matched only by the effortlessness of its installation. You'll appreciate the attention to detail that makes every part fit together perfectly. Prefabricated posts allow for quick and easy installation saving you time and money, and the modular design offers you options usually associated with custom-made systems. It's easy to finish off your railing project with the perfect handrail. 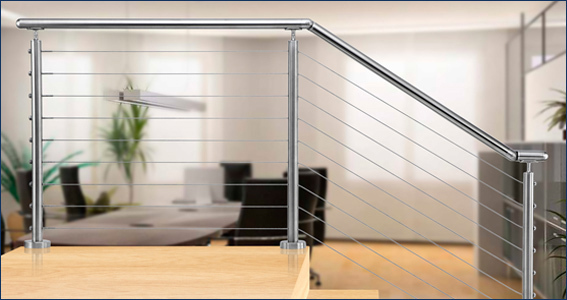 Our beautiful polished or satin 316 stainless steel tubing can be customized with a variety of end caps to complete your railing project. The railing system comes with everything you need for a quick and easy installation, including a threaded stainless steel terminal, Quick-Connect® stainless steel tensioning hardware, washers, and end caps. Cable Rail Assemblies are the perfect option for homes and offices. Assemblies come in 1/8" and 3/16" diameters, offering a high-strength, weather-tough alternative to metal or wood railing pickets. This railing infill is not only extremely durable and attractive but virtually invisible, allowing beautiful, unimpaired views. These prefabricated assemblies are sold in standard lengths from 5 to 70 feet (sold in 5 foot increments) that can be trimmed and finished in the field. The assemblies are laced horizontally through holes drilled in the intermediate posts of your railing frame, then tensioned at opposite end posts with specially-designed Quick-Connect® fittings. Contact EMS today for more info on a stainless steel railing system that will enhance your next project!